Finding words in a jumbled grid has never been so much fun, thanks to Zynga’s Scramble. The objective is to find as many words as possible in a 5×5 or 4×4 letter grid. You can click on letters in any way, provided the letters are linked in a chain and are in the correct order. The game has a nifty solo mode where you can practice your word finding skills as well as plenty of multiplayer challenges. Scramble allows you to play against their friends or go for a one-on-one challenge against other Facebook users. Playing against other Scramble players is more fun because you can challenge them in real time. You can see their scores and check whether you have scored more. Scramble ranks players according to the score. The words you find carry points (for example, three-letter words carry 1 point). The more you score, the better the chances of moving up the ladder. Each session of play has a timer and once the timer goes off, you play another round, which has a more difficult set of jumbled words in store for players. The solo ladder mode is also timer-based and tests your word finding skills. You can consider the solo mode as your practice playground before playing against other players in online multiplayer challenges. Scramble is one of the most popular word games on Facebook, and with so many real-time play options, it surely is the perfect office pastime you are looking for. With a challenging set of single-player and multiplayer games, Wordy tests your word making skills. This Facebook application has plenty of word games, including a Text Twist clone and fun games that will remind you of Bejeweled. There’s also a Scrabble-Scramble combo that uses similar-looking Scrabble tiles. The tiles need to be dragged and dropped in blank tiles to make words. There’s a game called letter linker that lets you link connected letters to make words. Of all Wordy games, my favorite is Word Twist. This game is quite similar to Bejeweled, but with a wordy twist. Letters are interchanged when you click on a letter tile, thereby forming two or more words. In Wordy, players can play with thousands of FB users in real-time. The multi-player mode features all the single-player games and is as challenging as solo play. Wordy is a great Sunday afternoon pastime, more so if you are playing Letter Linker with some of your FB friends in multiplayer. Currently, Word Challenge is one of the best Facebook word games played online. Developed by Playfish, the game allows players to create as many words as possible from a set of letters. They have to click on letter tiles to make plenty of three, four and five letter words before the timer goes off. Once a word is created, they have to press the green button to submit and see whether the word is present in the in-game dictionary. Players can also reorder the jumbled letters by pressing the red button. To move to the next level, all they have to do is press the yellow button to their left. They can also shuffle the letter tiles by pressing the space button and press the CTRL key if they want another round. Players earn points for every correct word entered and for every point earned they receive special coins which they can use to unlock more game modes, including a practice mode, quick-fire Turbo mode and a Word Grid. These game modes can be unlocked if you earn 10,000 coins. They can be earned in classic solo play or in the multiplayer “challenge" mode. With a simple, user-friendly interface, addictive game modes, and multiple language support, Word Challenge is a perfect game for word geeks. The classic Word Search can now be played on Facebook. Developed by Mindjolt games, Word Search II provides an entertaining dose of word searching fun by adding a few variations to gameplay. You can unlock special power-ups that let you cheat and find words more quickly. These power-ups need to be unlocked first and this can be achieved by earning points after searching words in the grid. Word Search II retains the classic pen-and-paper feel by allowing you to drag the mouse and mark the words on the grid. You can search for words in the list horizontally, vertically or diagonally and use special power-ups like Score Booster, First Letter and Word Exchange. First Letter gives you a hint by letting you spot the first letter of the list on the grid. 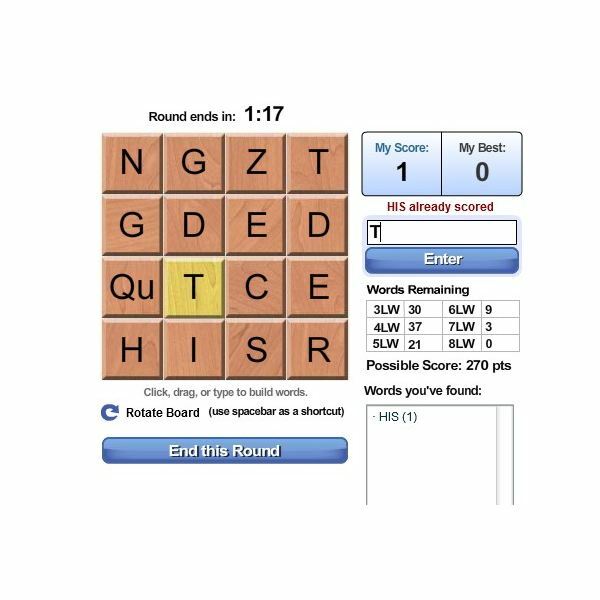 Score booster can be used to double the score of the word whereas Word Exchange is used to exchange words in the list. By adding some variation to the classic word search puzzle, this game offers plenty of surprises and is a must-play for all word game enthusiasts. The most popular Scrabble-like game for Android and iOS can now be played on the best social networking platform. With the nifty cross-platform functionality, it allows Android and iPhone users to carry their active games over to the social networking platform and play them online. Players will play against their FB buddies or random opponents asynchronously. This means the game is turn-based even on Facebook. When you complete your turn, FB’s internal notification system alerts your opponent. 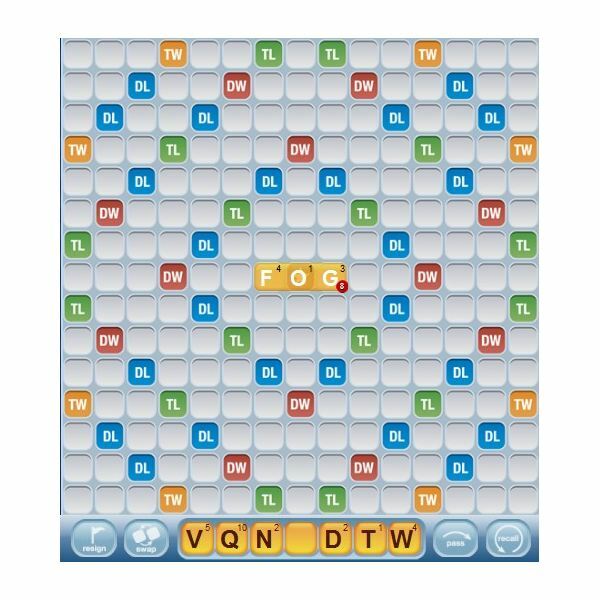 Clicking on the notification will take your opponent directly to the game board where he can begin spelling out words. Zynga’s Words with Friends is still in beta, so expect some new surprises and challenges in the near future. For now, you can play against your Facebook friends. Like Scrabble, Words with Friends provides hours and hours of word fun by allowing players to spell out words and take advantage of multipliers on special tiles to double or triple their score. Zynga’s word game blockbuster is addictive, fun and is the perfect Scrabble substitute you’ve been looking for.